Posting my sheets, those that aren't Item-related. Please comment / critique / suggest new poses / nitpick / etc. I need some direction! Looks good. The only complain I have is that in ALTTP, Zelda has long hair without ponytail. I can see that you borrowed a Four Sword's sprite. Might be easier to compare the two if I made her hair truly blonde... Perhaps I'll add a pallet for that. I also see the brown/gold part of her dress would need to be changed. I'll get it better the second time... I get a good night's rest. The unveiling... soon. You're gonna love it. Dude, I LOVE YOU!!!!!!! 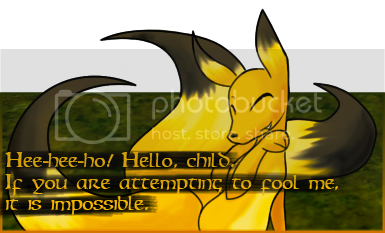 BABY VOLVAGIA IS SO COOL!!!!!!!!!!! Most of them are based on its (his? her?) adult form, with a few obviously added in for the sake of storytelling. I really want to finish this sheet! Oh, BTW, I'm using this dA picture for the reference. 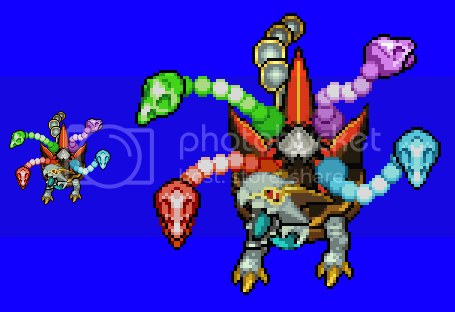 Dude, baby volvegia is so cool, could you try and do a dodongo too? Wow. This is really old. But here, some stuff I've done recently. They aren't really meant for sheets or anything, just some sprites to get your creative minds going. 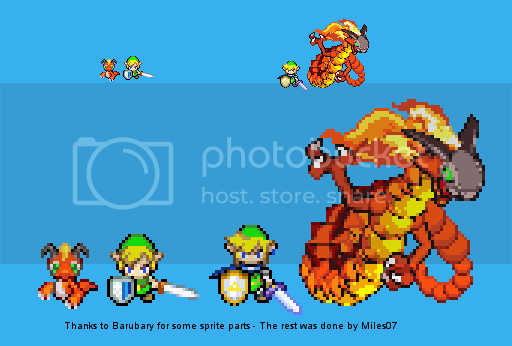 If anyone wants to make sprite sheets from these poses, they are free to go ahead and do so. I always like when somone acknowledges Ganty :-) and you did Trinexx too! Is this supposed to be Gantys transformed Version of Trinexx? Is this supposed to be Gantys transformed Version of Trinexx? Naw, I was just trying to get some sort of MC/FS-inspired version. I ended up going crazy and making a Trinexx that would make more sense in a Four Swords setting than anywhere else (see the four colored heads?). I do know that "Ghantinexx" is supposed to be more draconic in the manga, and more resembles a Gleeock the Dragon than Trinexx the Turtle. New mock-up image. This time, a Keaton, in MC style. Why don´t you use the MC keaton for the head? I think it would look better. Yes, I know, they're basically MC Keatons without the X on their foreheads and boomerangs instead of knives. But look closer! Muzzle fur! Just like Goriyas are supposed to have! Had some inspiration from RedKnightX, so I used his as a reference. In MC style. Free to use if you wish. 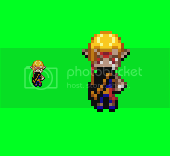 Can't you tell I love making TMC-style sprites? 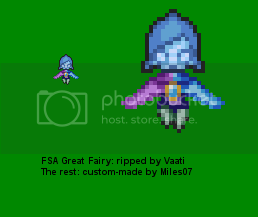 Indeed, credits to Sorceror Vaati for ripping the FSA Fairy Queen sprites. That's a pretty nice zola actually! Any plans to animate it? Sadly, no... I'm getting quite a kick with these one-off sprites, because my mind isn't thinking about how to animate them. You're welcome to go ahead and try, if you really want to. 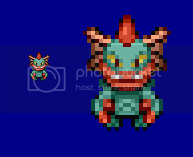 I FINALLY found good arms for the adult dragon, so I could make a sprite mockup. The fire-hair was also difficult to locate, but I found a suitable source. The rest looks definitely Minish Cap styled, even if it is fragmented from another MC boss.